As a travel blogger, I get inundated with posts from people about the amazing trips they're taking, so much so that it makes me want to max out my credit cards on flights to far-away places. But let's be real. I can't afford to do that, and my best guess is neither can you. I'm always looking to save money on travel, and I bet you are, too. So, how do we afford to travel? The truth is that sometimes I can't afford it. Full disclosure: I have travel debt. In the end though, those travel experiences were worth every last cent I'll eventually pay. But I don't like being in debt. In fact, I'm actively trying to reduce my debt so that I can travel more. As a result, I often look for ways to cut costs and can sometimes find amazing deals just by doing a little research. To help you find more adventure in your life I've compiled a list of ways that I travel cheaply. Here are my best tips to help you save money on travel. Many of the trips I've been on over the past several years have been work-related. The most recent of which was my trip to Columbus, Ohio. Turning your work trip into a mini-vacation can be an easy way to save money on travel, especially if you are being compensated or reimbursed for all/some of your travel expenses. For example, I took advantage of the flight and hotel reimbursement for my trip to Columbus by staying an extra night. That extra night only cost me $100, but that extra night gave me the opportunity to explore and have fun. Consider going a few days early or staying a few additional days and ask for the conference rate for the additional nights. Most hotels will oblige. Another way to save money on travel is to tag along with your partner when he or she has a work trip. Traveling with The Professor is one of the best ways I get to travel cheaply. Although my flight costs are not covered or reimbursed, the hotel is usually prepaid, meaning neither of us pays for room and board. He was recently invited on a work trip to San Francisco, and I was luckily able to go with him, allowing me to save money on accommodations. While he attended the conference I hit the streets to sight-see and explore. In the end, my trip to San Francisco cost me about $500-600 including my airfare, meals, and excursions. Choosing to travel during peak season usually means spending extra money on accommodations, flights and more. Instead of going to your next destination during prime travel season, consider going during shoulder season (off-season). Now, this may mean experiencing inclement weather, but the savings may be worth the risk. Many people choose to cruise during the off-season, ultimately saving them hundreds of dollars. I've traveled home to New Orleans during hurricane season many times, which translates to cheap airfare and discounted accommodations. Drastic temperatures can sometimes mean big savings on hotel accommodations and flights if you're willing to brave the weather. One of my most favorite travel experiences EVER was visiting Chicago in January. Little did I know when I booked my flight that I'd be there when a polar vortex (huge snow storm) would hit! Several feet of snow fell on the city during my 5-day stay. Temperatures dipped down to 13 degrees on my last day there. At times it seemed like I was the only tourist on the streets or in the museums. And never before had the city looked so beautiful than it did under the blanket of snow. It was one of my favorite travel experiences to date, and one that I would've missed had I not braved the weather. Choose an airline (or two) and stick with them, rain or shine, high or low. I primarily fly United or Delta for several reasons, including their mileage programs. I have credit cards (Chase United MilesExplorer Card and Premium Delta Skymiles American Express Card) for both airlines and take advantage of bonus mile opportunities as much as possible. And now I'm using the Chase Sapphire Reserve card, which means I'm earning tons of points toward travel on any airline!!! Because of my credit card accounts I don't pay for bags and get priority boarding, two "luxuries" that I'm willing to pay for. My loyalty has paid off BIG TIME in the past, most recently when I flew to round-trip to Ireland for $45. I've flown to round-trip to Houston for $17. I'm not a fan of discount airlines. I don't like being nickeled and dimed. Many travelers do use discounted carriers, but I've yet to cross that line. Sure, flying United or Delta is usually more expensive than flying Spirit or Southwest, the comforts and mileage programs are worth it to me. I'm a big fan of spontaneity, so programs and services that are designed to promote spontaneous travel are pretty much my favorite things ever. I love using Hotwire for savings on hotels and rental cars. I've also had good experiences with Secret Escapes (think Hotwire for boutique hotels). They email you secret savings on some of the most amazing accommodations all throughout the world. Another great tool that I've been using a lot is called Hopper. It's a flight tracker app that sends you notifications about flight paths you've selected. It will give you predictions, telling you to "buy now" or "wait for a better price". And, trust me, you want to buy now if Hopper tells you to. I didn't last week and lost out on an amazing flight deal. Shucks. My new favorite thing is GTFO, another app created by Hopper that offers last minute (think today or tomorrow) airline deals. I hope to squeeze in some short weekend trips next year using that nifty little tool! There are times when I need to know EVERYTHING about where I'm going, where I'm staying and what I'll be doing on a trip. But there are other times when I'm willing to throw caution to the wind and take a risk. Gambling on undisclosed hotel deals can feel a little risky, for sure, but sometimes the risk pays off in cold hard savings. A great example of this would be the time I used Secret Escapes to book a resort in Maui sight unseen. Programs like Hotwire's Hot Rate Hotels allow you to select preferred star rating, amenities, and area before rolling the dice, giving you some control while still encouraging spontaneity (and saving money). To me, there is nothing more classic than the good old American road trip. I adore long road trips and hope to take more in the coming year. Sometimes hitting the road can be a great way to save money on travel, especially if you can wait until the off-season to travel. Gas prices are typically lower in the Fall and Winter which can mean big savings at the pump. 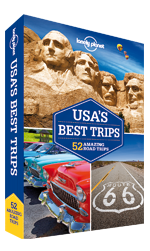 Road tripping also gives you greater control over other costs like hotel accommodations, meals, and attractions. Packed lunches anyone? Last year we decided to hit the road and head to Death Valley rather than go to Miami like we'd planned. The decision was made when we compared flight costs (even with off-season pricing) to gasoline prices. That was one of the best decisions we ever made. We got to see an incredible landscape, reconnect and spend time with each other, and save $1000. Last, but certainly not least, consider going on a local adventure. Staying local can have many advantages. You make the most out of a short period of time by cutting down on travel time. In addition to saving time, you can also save money on everything from transportation to accommodation. One local spot we've been to is Idyllwild, a small mountain town just a few hours outside of Los Angeles. I found a great getaway deal on Groupon for a few nights in a sweet little cabin and away we went. We've since been back and stayed in a friend's weekend retreat which cost us nothing. Ask your friends about their local adventures to get a taste of the best places to visit. You never know; one of them may have room for you on their weekend getaway. By now you know that I love traveling and want everyone to travel more. But, I'm also realistic about the costs of traveling and how unrealistic it can be for some. Incorporating travel into your routine doesn't have to break the bank. Instead you can find ways to save money on travel by being resourceful and doing your research. Carly, those are all great tips. I wholeheartedly agree that you should save your airline miles – but use them too! Love these travel tips. GTFO? Classic. I gotta check it out right now.